Click to view as PDF. 1. 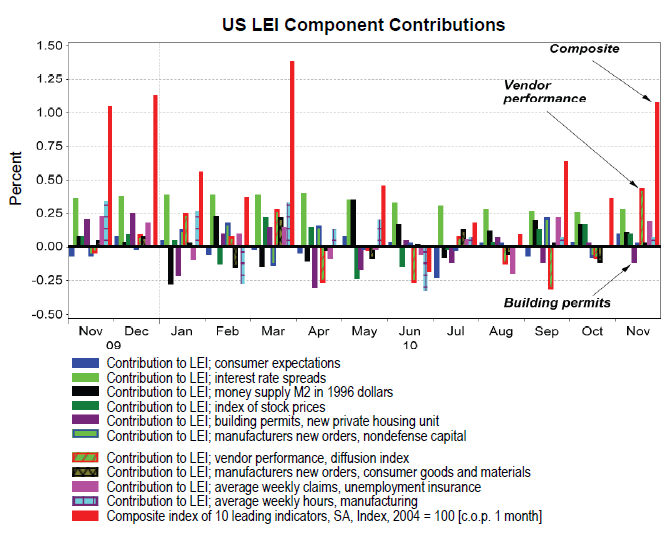 The index of US Leading Economic Indicators (LEI) has suddenly come to life, giving further evidence of resurgent growth. Nine out of the 10 components were positive for the first time since 2003, with only building permits in negative territory. 2. European corporate bond yields recently hit their highest spread ever versus US issuers. Lofty bond rates pose an enormous challenge for countries wrestling with deflation, such as Ireland. After factoring in falling prices, the prevailing 8.4% yield on Irish debt produces roughly a 10% real (or after-inflation) cost of money. 3. Thus far, real estate investment trusts (REITs) have been largely impervious to the sell-off that has impacted yield securities as a result of the recent interest rate jump. 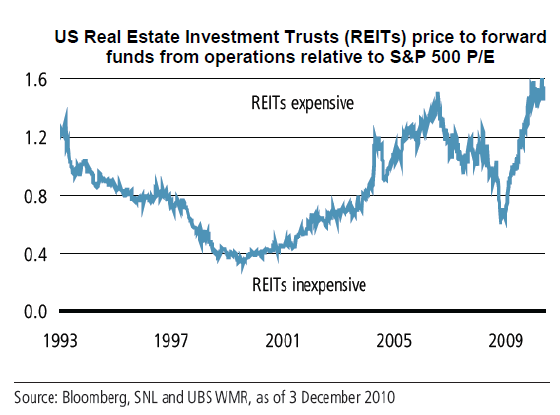 Despite this resilience, bulls on REITs should be aware they are trading at the highest relative valuation ever versus the S&P 500. 4. ISI’s founder and celebrated economic forecaster, Ed Hyman, observes that typically when unemployment peaks, future recessions are years away. Based on the current nosebleed-high jobless rate, he believes the odds favor an unusually long expansion. 5. Although stocks likely offer more return potential than bonds in the long run, the recent severe sell-off in the fixed-income world, combined with the continuing equity rally, may cause a reversal of fortune in the near term. Additionally, bullish sentiments on stocks and bearish attitudes toward bonds seem to be at extremes. Continental drift. For the first 20 years or so of my career, the derisive term “Euro-sclerosis” was frequently bandied about to describe Europe’s chronic condition. The idea was that its long record of anemic growth and creeping socialism had rendered that region’s economic arteries as clogged as those of an octogenarian with sky-high cholesterol. These days a more apt word synthesis might be “Euro-neurosis.” The once giddy hopes engendered by the formation of the European Union, and the promise of accelerated commerce due to a single currency, have given way to a profound anxiety bordering on depression. The situation has become so increasingly bleak that many experts seem to feel the Continent’s future is best summed up by the title of the famous play by Frenchman Jean Paul Sartre: No Exit. Another common catchphrase that popped up around the birthing time of the European Union was “Euroskeptic.” These jaded (or, perhaps, realistic) souls were incredulous that a collection of countries so diverse could somehow thrive with a common currency, especially when the political union was unquestionably, even intentionally, frail. The late, but surely great, economist Milton Friedman was one such doubter. And I must admit his logic made sense to me, landing me in the skeptic camp at least when it came to one currency for all. For many years, Euro-doubters looked unreasonably critical, even curmudgeonly. The benefits of a common monetary unit, the elimination of trade barriers, and the ability of all countries (even those with dubious credit histories) to borrow almost as inexpensively as Germany rendered the old Euro-sclerosis label obsolete. It looked like a new gilded age for Europe. Then all hell broke loose, and it was the cradle of Hellenic culture that did the breaking. What started out as just a Greek tragedy has escalated into a full-blown existential crisis of the kind Sartre would have appreciated. It is no longer considered deranged to speculate about the actual breakup of the European Union. Yet, despite my questioning view of the original scheme, I sincerely hope that won’t happen. While hope is nice, a cogent plan of action would be even better. Fortuitously, as mentioned at the end of the last full-length EVA, I did come across a compelling proposal that possibly offers Europe an exit strategy from its current quandary. As usual, it is courtesy of the agile minds at GaveKal Research, in this case from the gentleman who represents the Kal, Anatole Kaletsky. In my opinion, it has the potential to solve the twin banes of Europe’s current existence. A man with a plan. As is the case in America, the Eurozone has many challenges. But, as noted in the December 10th EVA, I would argue the Continent’s two most pressing are equity that is too low and a euro that is too high. 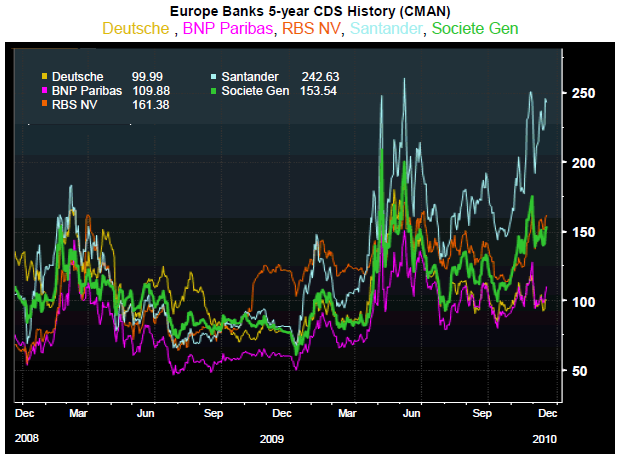 Related to the equity deficiency, Europe’s banking system is woefully undercapitalized. A major opportunity was missed this past summer when stress tests were performed and nearly all institutions were given a passing grade. Consequently, European officials did not force their banks to raise equity as happened in the US in 2009. At the time, Euro-skeptics (or realists), including yours truly, speculated this would likely come back to haunt them—and it has. Despite $100 billion bailout packages to both Ireland and Greece, there is scant evidence that the pandemic has been contained, even though the holiday season has brought a lull. The downgrade warnings keep coming, including for systemically crucial Spain. Bloomberg is even challenging France’s AAA rating. In my view, US investors are not sufficiently concerned about such ominous happenings. Unless viable solutions are found soon, the situation is likely to become an international crisis, just as it did last May. Already, the cost of insuring senior Euro bank debt against a default has hit its highest level since the worst days of this spring’s panic, and it is far higher than during the cataclysmic first quarter of 2009.
to create its own version of America’s much-derided, but ultimately successful, TARP (Troubled Asset Relief Program). In fact, Europe already has a vehicle that could perform this function, the European Financial Stability Fund (EFSF). If the EFSF were funded with a huge war chest, say $1 trillion, and given the mandate to make equity investments in Europe’s banks, the dynamics could change almost overnight. The weakest banks would simply be nationalized with their subordinated debt holders forced into common stock (as happened with GM in the US) or receiving cents on the dollar. This recently took place in Ireland with junior bond holders receiving a “haircut” of 80%, which I’m sure felt to them much more like a decapitation. Stronger institutions would see their shareholders diluted but not wiped out while their preferred and bond owners would be unscathed, similar to what happened with the healthier US banks. Actually, due to the equity infusion, these entities would be stronger and this process would preclude the possibility of cascading bank runs. Presently, allowing a bank panic in a country like Spain runs a very high risk of producing an exodus of deposits from every weaker country into Germany and a few other perceived “safe” countries (though German’s banks are far from Fort Knox). This scenario might very well sound taps for the great European experiment. Thus, preventing it from playing out is of paramount importance, not just for Europe, but for the planet. With adequate capital, Europe’s banks and insurance companies (supposedly in even worse shape) would be able to take write-downs and clean up their loan books. Currently, if they did this not many would survive, including a number in Germany. Both Germany and Spain have a network of smaller lenders (similar to the old US S&L industry) that are reportedly so moribund they make the zombies from Night of the Living Dead look like Irish River Dancers. Of course, a key question is: Where will all this money come from? And the answer is: the Euro-community will borrow it, or print it, or maybe more than a little bit of both. The Germans, in particular, are apt to find this repugnant, and such Fed-like behavior is likely to send the euro careening lower. But that would actually be another big benefit. After some initial wailing and teeth gnashing, Germany might well be much less hostile to this type of remedy, especially given that many of its banks are in acute need of reliquification. Additionally, its industrial sector certainly understands the wonders of a weaker euro for Germany’s export machine. Most importantly, a dramatically cheaper euro would be an immense relief to the “Club Med” constituents―Spain, Italy, and Greece―not to mention their economic soul mate, Ireland. To say those countries desperately need to catch a break is like observing that Mel Gibson could use a good press agent (not to mention a muzzle). It’s a radical plan, for sure, but to quote one of the wisest men I know, you can’t walk on water if you don’t get out of the boat. And right now Europe needs a miracle of Biblical proportions. Sometimes, not such a great notion. Speaking of radical plans, the Fed under Ben Bernanke has displayed no shortage of creativity almost approaching recklessness. Many of these gambits have worked admirably, but its latest ploy, Quantitative Easing, the sequel, continues to come up snake eyes. Last week, the yield on the 10-year Treasury note hit nearly 3.6% before backing off a bit over the last few days to 3.3%. This is up from 2.3% in October when the Fed’s second round of quantitative easing had been rumored but not actually launched. To say that the good ship QE II is springing more than a few leaks is putting it mildly (I don’t envy Mr. Bernanke the inquisition he’s going to get at the hands of his personal Torquemada, Ron Paul, in the months ahead). If the Fed were to perform such a midcourse correction, I believe it would further catalyze a trend that I see gathering momentum: the restoration of confidence. It’s a feeling I’m picking up in a growing number of conversations with Evergreen clients. There’s definitely a sense that the government isn’t as militant toward capitalism, and its practitioners, as it was just a few months ago. The missing element continues to be preventing a date with national insolvency. Certainly, the saga unfolding in Europe should convince even our typically courage-challenged politicians of the urgency of remedial action. And, just as certainly, the recent tax package only makes matters worse, despite the possibility that its growth encouraging nature will mitigate the hemorrhaging of additional red ink. The willingness of the supposedly fiscally responsible GOP to endorse the president’s tax proposal has added to the air of cynicism regarding any type of credible budget emanating from the incoming members of Congress. But I think that’s misguided. It’s my belief that they mean what they say and these newbies are going to coalesce around elements of both the president’s blue ribbon budget commission and Rep. Paul Ryan’s road map for fiscal reform. If it turns out that way, this will be another shot of adrenaline to investors, consumers, and business leaders. It’s hard to overstate the positive ripple effects. To understand why, it might be helpful to consider the main reason the Fed has thus far been unable to create the normal escape velocity seen coming out of a recession. The Fed’s biggest hurdle harkens back to an old formula created in the early part of the 20th century by one of America’s pioneering economists, Irving Fisher. It went: MV = PQ, which means money times velocity equals prices times quantity. Or, to clarify, the amount of money multiplied by the speed with which it circulates is equal to the total economic output, i.e., GDP. Therefore, money and its velocity are absolutely crucial to the economy. raised its expectations for both US and global growth as well as the outlook for its own business. Clearly, few companies are as in tune with the economy’s biorhythms as is FedEx. This raises a question: Who to believe―Fred Smith or Bill Gross? Maybe not so new. One loyal EVA reader recently emailed me to ask whether we ascribe to the much publicized theory by bond behemoth Pimco that we are in a “new normal.” This premise assumes growth stays stuck in low gear for years due to too much government, too little lending, traumatized consumers, downsizing businesses, and a general sense of foreboding akin to how Seahawk fans feel before every opening kickoff. So where does little Evergreen Capital come down in this opinion exchange among titans? Here’s our take in a nut (some might say, nutty) shell: The past has been Gross but now Washington is coming to Mr. Smith. Unquestionably, Pimco got the script largely correct for the last few years, but it now seems a tad too focused on the rearview mirror. In contrast, those folks who actually run businesses are discerning a quickening tempo and upgrading their views of 2011. Most important of all might be the attitude adjustment which is becoming increasingly evident from both that sprawling house on Pennsylvania Avenue and that brawling place on Capitol Hill. Removing this “regime uncertainty” (a term coined by Professor Robert Higgs; for more on this topic please see our October 22nd EVA archived on our website: www.evergreencapital.net) is an enormous positive, in my opinion. For sure, there is much more work to be done; I get a queasy feeling in my gut every time I think about trying to control our wealth-devouring health-care beast. However, it does seem like some adult supervision is at long last returning to Washington, DC (even in this Washington, there is incipient progress toward fiscal rationality). As uncertainty morphs into confidence, it’s almost a given that the aforementioned money multiplier will begin to rise. In my view, this will have the same effect as repeated interest rate cuts did back in the good old days when the Fed actually had room to reduce the cost of money. Just as there’s a tendency to underestimate feedback loop phenomena when the environment turns negative, there’s also an inclination to sell short (in some cases, literally) a virtuous cycle. Don’t get me wrong: It’s highly improbable we will see a rip-roaring economy next year. 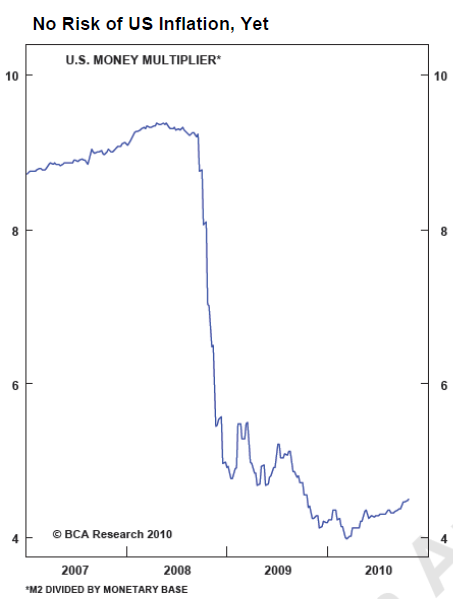 This recovery will likely fall short of the usual hockey stick bounce-back that typically follows deep recessions. In that regard, Pimco’s overarching thesis still applies. But what this expansion lacks in acceleration it might very well make up for in duration. Unemployment is still high; real wages are declining…The current slump already ranks as the longest period of sustained weakness since the Great Depression. That was the last time the economy staggered under as many ‘structural’ burdens, as opposed to the familiar ‘cyclical’ problems that create temporary recessions once or twice a decade. This was published in Time Magazine in the fall of 1992! The S&P 500 subsequently generated a 370% gain over the next eight years. Happy Hanukkah, Merry Christmas, and here’s to a New Year that helps us forget the new normal. This report is for informational purposes only and does not constitute a solicitation or an offer to buy or sell any securities mentioned herein. This material has been prepared or is distributed solely for informational purposes only and is not a solicitation or an offer to buy any security or instrument or to participate in any trading strategy. All of the recommendations and assumptions included in this presentation are based upon current market conditions as of the date of this presentation and are subject to change. Past performance is no guarantee of future results. All investments involve risk including the loss of principal. All material presented is compiled from sources believed to be reliable, but accuracy cannot be guaranteed. Information contained in this report has been obtained from sources believed to be reliable, Evergreen Capital Management LLC makes no representation as to its accuracy or completeness, except with respect to the Disclosure Section of the report. Any opinions expressed herein reflect our judgment as of the date of the materials and are subject to change without notice. The securities discussed in this report may not be suitable for all investors and are not intended as recommendations of particular securities, financial instruments or strategies to particular clients. Investors must make their own investment decisions based on their financial situations and investment objectives.